BioConnections distribute the full CHROMagar range, dehydrated for reconstitution in your laboratory. 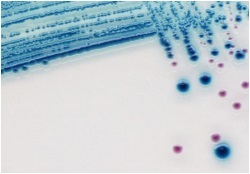 O157, Salmonella, E. coli enumeration & antibiotic resistance - just a few areas that CHROMagar excel in. Therefore, several regulatory authorities urge worldwide food industry to implement measures to control the absence of such organisms in their production. In many cases, laboratories have limited their search for pathogenic E.coli to the common O157 serotype. This is due, among other reasons, to the fact that there were no available selective culture media for non-O157 E.coli. CHROMagar STEC is designed to fill this gap: detection, as mauve colonies, of not only the classical STEC O157, but also many other serotypes.